A Steeple engine is so called because of the resemblance of the piston rod extension to a church steeple. It is sometimes confused in model engineering circles to a table engine, but the difference is quite easy to see. The cylinder in a table engine literally sits on a table. With the crankshaft below the table. With a steeple engine the cylinder sits at floor level and the crankshaft passes over the cylinder. This is apart from marked differences between the piston and connecting rod arrangements. Steeple engines were an early attempt to get away from the beam engine arrangement. The first steeple engines were designed by Napier in the 1830s for use in paddle boats. The cylinder went in the bottom of the boat, the crankshaft was at deck level, and the upper section was housed in a deck house. 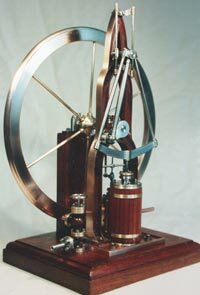 The model is based on a land engine of the 1860s. The flywheel construction is quite interesting. Full size the boss and rim were cast around wrought iron spokes laid in the foundry mould. This is not possible in a model, so the boss is built up and the rim is a gunmetal casting that can be machined all round. The spokes are rods Loctited in position. The lathe is used as a jig to hold them in position while the Loctite cures. The model has a 9” (229mm) diameter flywheel. The base, flywheel rim, main frame, cylinder, steamchest and eccentric strap are gunmetal castings. The other parts are machined from mild and stainless steel bar stock. A full set of 22 A4 drawings are available plus a parts list. The drawings have both imperial and metric dimensions. The engine is a delight to watch in motion and an interesting project to build. Construction is possible on a 3 ½” (90mm) gap bed lathe. The gap being needed for the flywheel.